By chance, I saw a tweet from the HSCIC yesterday announcing Prescribing for Diabetes, England – 2005/06 to 2014/15′ http://bit.ly/1J3h0g8 #hscicstats. The data comes via a couple of spreadsheets, broken down at the CCG level. As an experiment, I thought I’d see how quickly I could come up with a story form and template for generating a “data driven press release” that localises the data, and presents it in a textual form, for a particular CCG. 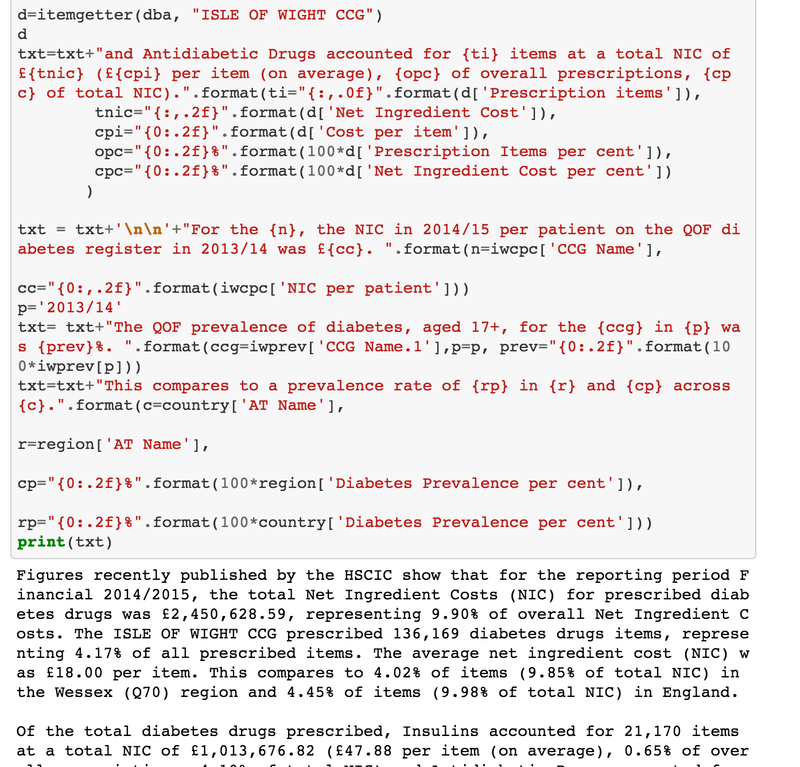 It took a couple of hours, and at the moment my recipe is hard coded to the Isle of Wight, but it should be easily generalisable to other CCGs (the blocker at the moment is identifying regional codes from CCG codes (the spreadsheets in the release don’t provide that linkage – another source for that data is required). Figures recently published by the HSCIC show that for the reporting period Financial 2014/2015, the total Net Ingredient Costs (NIC) for prescribed diabetes drugs was £2,450,628.59, representing 9.90% of overall Net Ingredient Costs. The ISLE OF WIGHT CCG prescribed 136,169 diabetes drugs items, representing 4.17% of all prescribed items. The average net ingredient cost (NIC) was £18.00 per item. This compares to 4.02% of items (9.85% of total NIC) in the Wessex (Q70) region and 4.45% of items (9.98% of total NIC) in England. Of the total diabetes drugs prescribed, Insulins accounted for 21,170 items at a total NIC of £1,013,676.82 (£47.88 per item (on average), 0.65% of overall prescriptions, 4.10% of total NIC) and Antidiabetic Drugs accounted for 93,660 items at a total NIC of £825,682.54 (£8.82 per item (on average), 2.87% of overall prescriptions, 3.34% of total NIC). For the NHS ISLE OF WIGHT CCG, the NIC in 2014/15 per patient on the QOF diabetes register in 2013/14 was £321.53. The QOF prevalence of diabetes, aged 17+, for the NHS ISLE OF WIGHT CCG in 2013/14 was 6.43%. This compares to a prevalence rate of 6.20% in Wessex and 5.70% across England. All the text generator requires me to do is pass in the name of the CCG and the area code, and it does the rest. You can find the notebook that contains the code here: diabetes prescribing textualiser.